Our most valuable jewelry - rings, pendants, watches and medals are often conduits of memory and beautiful treasures that embody some of our most cherished moments. With loving, hopeful hearts we give and receive small objects made with rare and precious materials which ultimately outlive us and carry something of ourselves into the next generation. Stone, metal and glass transformed in the deft hands of a Master Jeweler carry myriad promises - love, hope, friendship, strength, devotion and time. For over 20 years Fort Thomas Jewelers has built a solid reputation as a trusted hometown business. 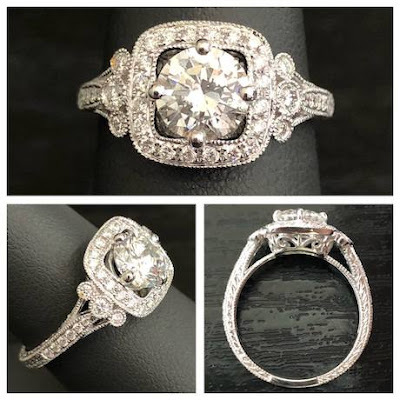 They are the area's only IJO (Independent Jewelers Organization) certified retailer and have been entrusted to design, engrave, appraise and repair jewelry from residents of Fort Thomas, Highland Heights and the surrounding communities and cities. 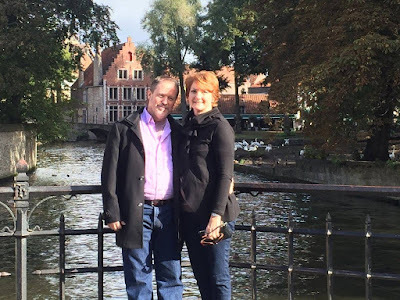 Owners Vince and Renai Keairns and the entire staff at Fort Thomas Jewelers are passionate about jewelry and scrupulous in their product selection and services. They offer the finest diamonds (ethically sourced) and gemstones, engraving services and perform on-site repairs. Originally located in Fort Thomas they have been at their new location for over five years fitted with state of the art technology in Highland Heights. Fort Thomas Jewelers is located at 2780 Alexandria Way, Highland Heights, KY in the Highland Pointe Plaza near Northern Kentucky University. 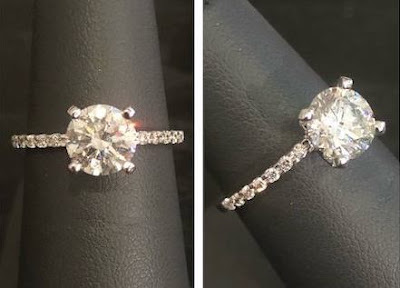 From FTJ's Facebook: Cast in 14k white gold and set in prong settings are, in order: a 1 carat round, 2.21 carat pear, 2 carat round followed by anouther 1 carat round diamond! Yeah! We added a fitted diamond channel band just to make sure this guy had the maximum amount of sparkle allowed on a finger and boom! 7.21 carat total weight and one for the records! 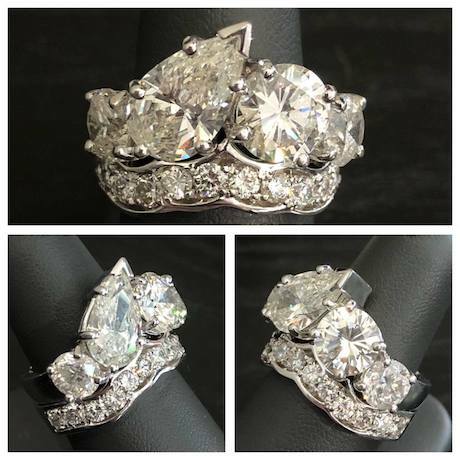 WHY CHOOSE FORT THOMAS JEWELERS? Repairs While You Wait - Most of us are unwilling and uncomfortable leaving our most valuable, irreplaceable and sentimental possessions in unknown hands. Fort Thomas Jewelers offers a "repairs while you wait" service. Because there are always specialists on site your jewelry doesn't have to leave your sight, much less the building. Master Jewelers - Collectively, the staff has over 100 years of expertise in jewelry design, setting, repairs, gem grading and finishing. There is always a GIA (Gemology Institute of America) Certified Gemologist on site. 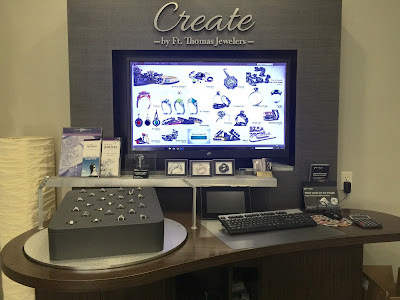 On-Site Create Bar - Fort Thomas Jewelers is an innovative, state of the art facility staffed by industry professionals that includes an on-site Create Bar where customers can be fully involved in the design process. How it works: You tell us what you had in mind, and we'll create a 3-D photo-realistic version. We'll tweak and play until it's perfect, and then our expert craftsmen will get to work. Come back in a few days and pick up your custom, one-of-a-kind ring. The rest is up to you! Mix and match from each category to build the ring that's exactly what you want. Or sketch out an idea and we'll turn it into the real thing! Stop into our store for a no commitment trial demo and more details! All new inventory - after holiday restock! 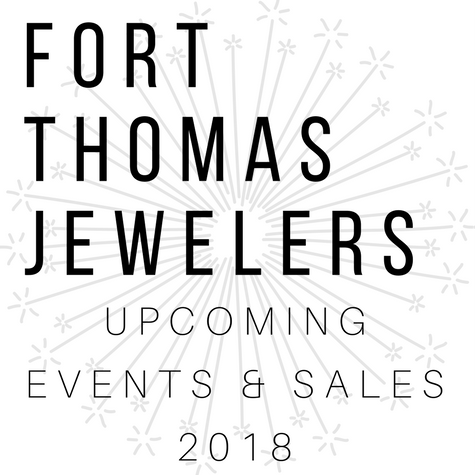 January is the time for new inventory at Fort Thomas Jewelers. Browse new items even if you're not ready to buy. While you're there get your rings and jewelry cleaned and checked - sweaters and gloves can wreak havoc on jewelry. Have your precious items cleaned and checked every six months to keep them in tip-top shape - it's FREE! Diamond engagement ring specials with interest free financing options! All new inventory will be priced to sell just in time for Valentine's Day. 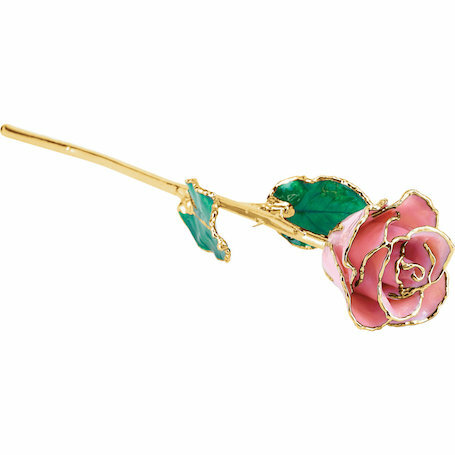 From 24k gold dipped roses (only $99) to diamond engagement ring specials (including interest free financing options). Getting ready for bi-annual trip to the diamond cutting capital of the world: Antwerp, Belgium! Bi-annual trip to the diamond cutting capital of the world: Antwerp, Belgium! In April, owners Vince and Renai Keairns will be making their bi-annual trip to the diamond cutting capital of the world: Antwerp, Belgium. 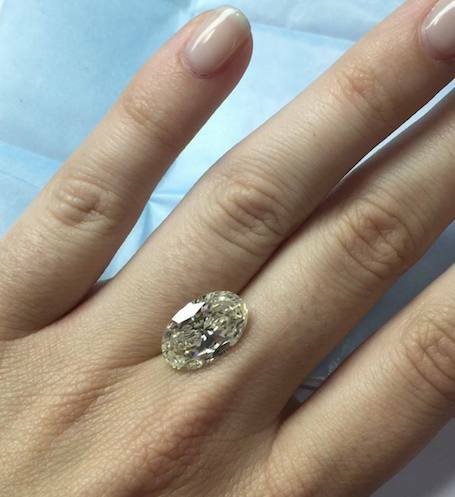 No budget is too small to preorder your very own "handpicked" diamond. Call or stop in to discuss this amazing opportunity. From round, brilliant cuts to oval and pear shapes the trip is an opportunity to hand select diamonds that have never been seen before. Official leave date to be determined, pre-sales to begin in March. If you're planning a spring engagement an Antwerp diamond could be your best bet!